"Megan truly listens to her client's wants and beauty concerns. She is a true artist in both hair and makeup. Megan proves to have grace under pressure which is so important when working with a bride on her wedding day. Her natural style and positive vibes are what make her a client favorite." "Hair and makeup was the biggest stressor of my wedding planning. I don't wear a ton of it and was worried I would look like someone completely different on my wedding day; something both me and my hubby didn't want. Megan not only made me feel absolutely beautiful, but she also gave me a new found love of getting my makeup done! My makeup lasted for hours in 80 degree weather, to which I was amazed. She listened to exactly what I wanted and gave me so much more. I loved her work so much that she's done my makeup for other events as well. Her prices and her quality cannot be beat!!!" 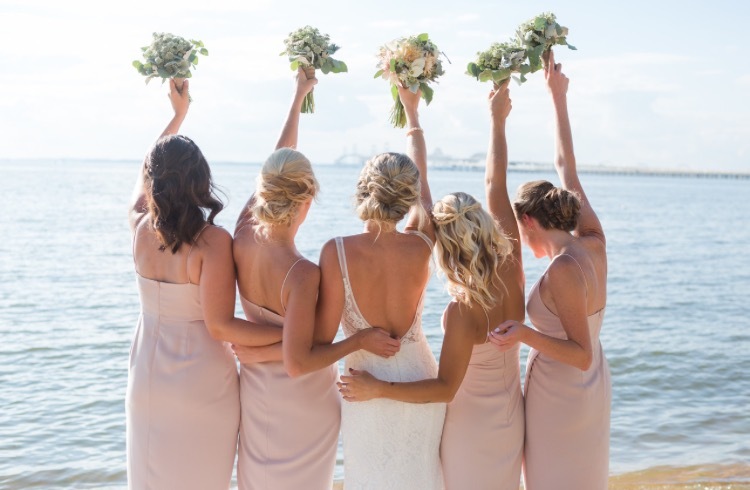 "I wouldn't have wanted anyone else to be doing our hair and makeup on my wedding day! Megan blew all of my expectations out of the water. Professional and attentive, Megan made sure she knew exactly what I, my mother, and my bridesmaids individually desired. I was the sweatiest bride this Earth has ever seen, and my hair and makeup help up beautifully. Most importantly, Megan was warm, loving, and so much fun to be with. From the trial to wedding day, we all felt comfortable and at ease. There was a lot of love on wedding day, and Megan was a part of that." "I cannot say enough good things about Megan and the work she does. My make-up and hair looked completely natural and stayed in place despite 90 degree temperatures, a thunderstorm, and an evening of dancing. I came to Megan with ideas and she helped me pick out the best style for my hair type. She was very receptive to feedback and so easy to talk to. I don’t normally wear makeup because I have sensitive skin, but Megan's products didn’t make me break out at all. I loved how she was able to enhance my appearance but still make sure I looked like myself. I would 100% recommend Megan to anyone looking to have their hair and makeup done. I will definitely be reaching out to Megan again for future events!" "To say Megan was amazing would be an understatement. I was recommended Megan by a family member and I am so lucky to have connected with her. Hair and makeup was a very important aspect to me for my wedding (as I'm sure is for most brides), so it was important to me to find someone who knew exactly what I wanted, was good at it and was willing to listen to me go back and forth trying to decide what to do. Megan came to my house for a hair and makeup trial which was awesome. She tried two different hairstyles for me, both of which I loved - which made it hard for me to decide. The makeup looked perfect as well and I knew she was the one to go with immediately. Not to mention, she was fun to hang out with. We had great chats and felt like we had known each other forever. She made me, my mom, and sister feel so comfortable during the whole process. When the day of the wedding came, Megan and her assistant Jill got there right on time and ready to go. I had four bridesmaids and she did all of their hair as well - both up and down styles and I loved every single one of them. They all held up through the night too. She was so fun to be with when we were all getting ready too - which makes the day so much better. When she got to my hair, I still hadn't decided whether to go up or down, so she did my hair down, did my make up, then let me decide if I wanted her to keep going and put it up. I'm the most indecisive person, if you can't tell. Luckily I had some bridesmaids to help me decide and I'm so incredibly happy with how it turned out. Our wedding was over a month ago and I still have people coming up to telling me how amazing my hair looked. She is a miracle worker. I also asked her to crank up the makeup a notch from the trial session, and she did it perfectly. I felt pretty and natural, and she made my eyes pop without feeling like I had a ton of makeup on. To sum this up, I highly recommend Megan and her team for both hair and makeup. I felt flawless that day and it was 100% because of her." "As mother of the bride, I just want to say what an awesome job Megan did getting my daughter, six attendants, and myself ready for the wedding.She came to our house bright and early and everything was so smooth and she made it very fun! On the day of the wedding, we awoke nervous, however, when Megan and her assistant arrived, she not only made everyone look beautiful, but put everyone at ease with her calm and easy-going personality that made anything we were worried about just melt away! I could not imagine a more perfect scenario after a stressful night! Thank you Megan!"